SUPPORT MY NEW BOOK PROJECT! A unique guide about honoring your needs, following your gut and checking your ego at the door to find personal and professional fulfillment. One of my best friends likes to say I have “titanium balls.” What I think she means is I am able to weather whatever is thrown at me with a certain level of grace and ease , or at least confront it head on and move through it, no matter how painful it might be. I have other friends and clients who say “You’re so together.” I can assure you in some ways most definitely I am not, along with the many ways I am. But even in the ways I am not “together,” I’m very much aware and accepting of it, and acknowledge I am a work in progress trying to learn and improve with each day. I have acquired and developed tools and understanding to put things in context and help me move forward, and am in a constant state of gratitude and growth. What I do know for sure is I am on the right path doing work I love that is constantly evolving organically . My work is deeply meaningful and has had a positive impact on hundreds of men and women over these past nearly 20 years. All of that is to say, I have learned a few things and have something to say about how you can live a life that is aligned with who you are and allows you to have sense of inner peace. We are living in dynamic, rapidly transforming times, and I wanted to offer a framework and guide to help you navigate them based on all I know and have experienced personally, as well as observed with the hundreds of clients, volunteers and interns I’ve worked with over the past two decades. 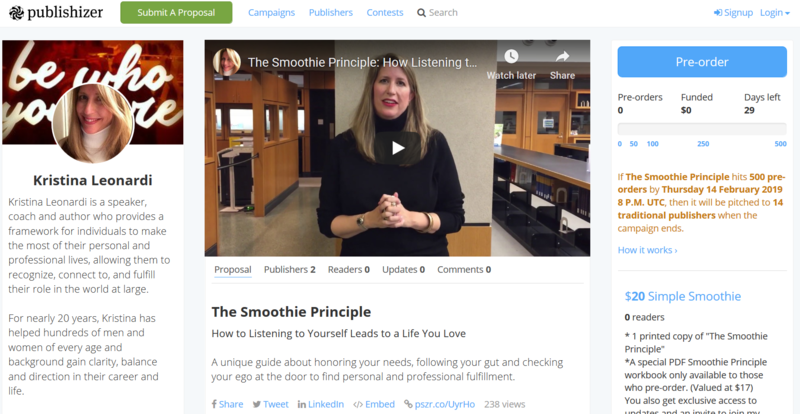 It’s called The Smoothie Principle: How Listening to Yourself Leads to a Life You Love. SO, this is where you come in . I’ve signed up to do a 30-day book proposal campaign on a crowdfunding platform called Publishizer . I basically need to get 500 pre-orders in order to show interest and enthusiasm for the book and get noticed by the big publishers. And as a thank you for your confidence and interest in The Smoothie Principle , I’m offering some really great bonuses and opportunities to work with me. I also ask for your patience as this campaign heats up – it goes until February 14th (how perfect for Vday!) so you’ll be getting various reminders and updates in addition to the emails you already receive from me…. I promise there won’t be as many after it ends! Check out the link here or below to pre-order and any posting or sharing via social media will be much appreciated! THANK YOU FOR YOUR SUPPORT! Please feel free to contact me should you have any questions at all or need more information about the book or any of the bonuses. I look forward to sharing this publishing journey with you!